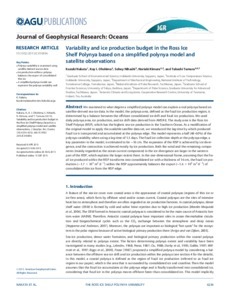 We examined to what degree a simplified polynya model can explain a real polynya based on satellite-derived sea-ice data. In the model, the polynya area, defined as the frazil ice production region, is determined by a balance between the offshore consolidated ice drift and frazil ice production. We used daily polynya area, ice production, and ice drift data derived from AMSR-E. The study area is the Ross Ice Shelf Polynya (RISP), which has the highest sea-ice production in the Southern Ocean. As a modification of the original model to apply the available satellite data set, we introduced the lag time by which produced frazil ice is transported and accumulated at the polynya edge. The model represents a half (48–60%) of the polynya variability when using a lag time of 1.5 days. The frazil ice collection depth at the polynya edge, a key parameter in the model, is estimated to be ∼16 cm. The expansion of the RISP is achieved by ice divergence, and the contraction is achieved mostly by ice production. Both the wind and the remaining components (mainly regarded as the ocean current component) in the ice divergence are larger in the western part of the RISP, which explains the larger extent there. In the one-dimensional frame, assuming that the frazil ice produced within the RISP transforms into consolidated ice with a thickness of 16 cm, the frazil ice production (∼1.7 × 103 m2 d−1) within the RISP approximately balances the export (∼1.6 × 103 m2 d−1) of consolidated thin ice from the RISP edge.